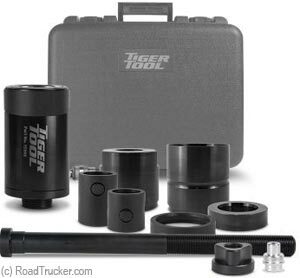 The 10730 Service Kit will easily remove and install the Freightliner Airliner and Peterbilt Low Air Leaf rubber isolated pin and bushing while the suspension remains on the vehicle. Manufactured from High-grade Metals with black oxide finished coating resists corrosion. Available as an adapter kit (Part No. 15030) to the 15000 Pin & Bushing Kit.